An earthquake of 8.9 magnitude hit Japan today. 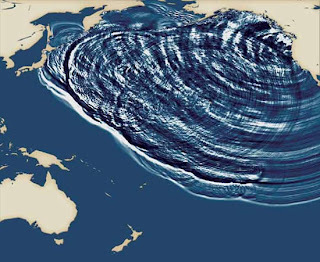 It is the biggest earthquake in Japan in past 140 years and the magnitude of the earthquake is 7th largest ever recorded in the world, sparking off 10 meter high tsunami wave that swept everything on its way. Until now there is a report of death of at least one person. Public broadcaster NHK said, sparked fires and the wall of water, prompting warnings to people to move to higher ground in coastal areas. Japan has shut down its nuclear and oil refineries to prevent any further damage. There is no report of leakage of nuclear radiation till now. Latest reports say Japan has declared state of emergency for five nuclear reactors at two power plants after the units lost cooling ability due to the consequences of the earthquake. Reports are coming that US is providing nuclear reactor coolant to Japan. Meanwhile America’s has expanded its warning to entire pacific coastal region. The tsunami refreshed the terrifying memories of 2004 Indian Ocean tsunami which caused a lot of destruction in the region. Update: The report from the local media said the toll has exceeded upto 1000. There are probable chances of these numbers to increase. Japanese Prime Minister Naoto Kan said “The earthquake has caused major damage in broad areas in northern Japan,” while he was addressing the news conference. If you are worried for the safety of your friend or relative who is in Japan right now and if he or she is not picking up your calls or replying to your messages consider using the below tool to find his or her status. If you are in Japan and have information about your friend or relative then use the second option to give information so that his relatives or friends can track him. If you are a webmaster kindly include this Person Finder tool on your website to help your visitors. Update 2: Almost all power stations on the Pacific East Coast of Japan, north of Chiba prefecture (just southeast of Tokyo) have been shut down including all Japan Railways service East and North of Shizuoka Prefecture. Public transport in Tokyo is totally suspended. Tsunami went off scale upto 7.3 meters at the port of Souma in Fukushima Prefecture. Reports says there have been 3 aftershocks greater in magnitude in Richter Scale and six more all between magnitude 6.0 and magnitude 6.9 so far. It is believed that more such shocks are expected but now in small magnitudes. We pray for the people who are affected by the Tsunami and the Earthquake. United Nations, International Atomic Energy Agency, United States, United Kingdom, India, China, Canada, Germany has expressed their interest in helping Japan and the people of Japan who are affected by the earthquake and tsunami.